The Lavender Rights Project is hosting our first-ever Art Auction Fundraiser on Friday, December 14, 2018 from 5:00-9:00pm at All Pilgrims in Capitol Hill. Sliding scale tickets can be purchased here. The event’s silent auction will feature over 25 pieces of art from local queer and trans artists, as well as opportunities to purchase some featured artists’ prints and merchandise as non-auction items from the artists directly. Whether you’re on the lookout for a new centerpiece for your home or a unique gift for the holiday season, the Art Auction Fundraiser is a great place to shop local and support queer and trans artists. Check out some of the featured artists below. Joey Veltkamp makes text-based fabric work and drawings which aim to comfort. His work has been shown at Seattle Art Museum, Frye Art Museum, Tacoma Art Museum, Greg Kucera Gallery, SOIL, and other galleries in the northwest. Joey lives in Bremerton, Washington, with his husband. Veltkamp’s piece, In Rainbows (pictured above), can be found at the Art Auction with a starting bid of $500. You can also check out information about select solo and 2-person exhibitions on his website. ST Rivera is a self-taught ink artist, born and raised in the Bronx, NY. 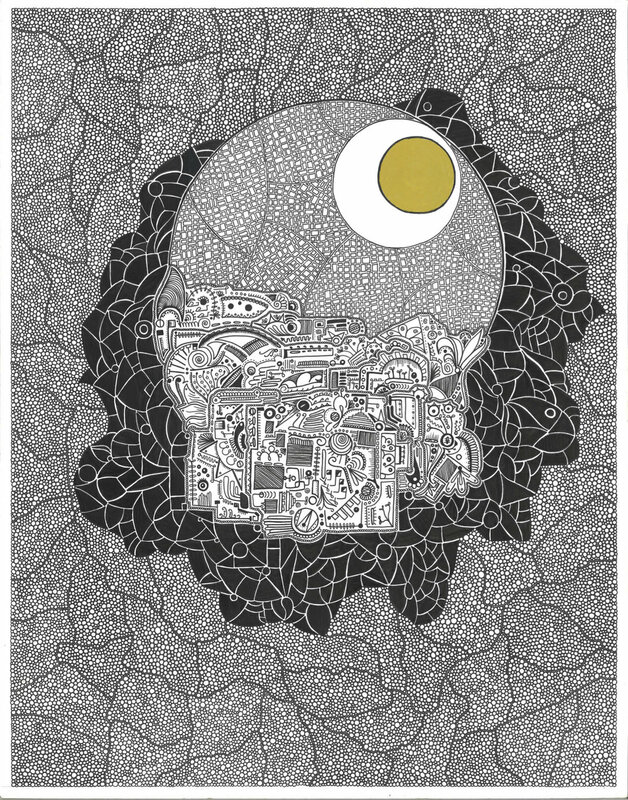 Her artistic style is best described as circlism, due to the thousands of meticulously placed circles in her drawings. She is often inspired by vivid dreams as well as patterns found in the natural physical world. Since 2014, Rivera has exhibited in numerous art walks, pop-up markets, and galleries in the Seattle area, as well as across the country. ST works out of her home studio in the First Hill area of Seattle. You can find ST Rivera’s Her Mourning Elegance (pictured above) at the Art Auction for a starting bid of $750, as well as additional non-auction items. Growing up as a young gay man in the suburbs of St. Paul Minnesota, JAF (aka Jason Andrew. F) documented many misfortunes in life via coloring, drawing and painting with silly paint kits bought by his mother — but due to the dark content of the material, JAF always hid and disposed of most anything that would have raised questions. This was the beginning of his fear to share anything creative with anyone. After breaking the chains of self doubt, religious abuse, and truly reconnecting with his creative self, he started to create heavily with Polaroids and paint after relocating to Seattle in 2003. It quickly escalated to photography, painting and mixed media. This is the start of a creative journey, that's unfurling itself in a backwards motion. JAF currently lives and works in Seattle. You can find JAF’s piece, Mein Trumpf (pictured above) at the Art Auction with a starting bid of $500, or catch him at “Forgive Me Father For I Have Sinned” during the Capitol Hill Art Walk at The Factory in April 2019. Eden Francis is a self taught visual artist, creepy creator, and lifelong aspiring painter who has worked mostly with ink and marker. As a queer, non-binary, and mentally ill artist from Phoenix, AZ, a major theme in Eden’s art and personal life has always been perseverance. Through their art, Eden has explored spirituality, trauma, mental illness, self worth, and other forms of personal symbolism. Eden hopes to use their art as a platform to tell their story and de-stigmatize “scary” mental illnesses such as Borderline Personality Disorder, Schizophrenia, Dissociative Identity Disorder, and Bipolar Disorder. They currently live and work in Seattle. Eden’s newest piece, Untitled (pictured above), will be available at the Art Auction with a starting bid of $120 along with additional non-auction prints. Check back next week for more featured artists from the event, and go to our Art Auction page to see a more complete listing of the art pieces available during the silent auction, purchase tickets, or sign up to volunteer! Founded in 2016, the Lavender Rights Project advances a more just and equitable society by providing low-cost civil legal services and community programming centered in values of social justice for trans and queer low-income people and other marginalized communities. The Lavender Rights Project aims to combat the gatekeeping of legal knowledge and mobility by building community-based familiarity with legal processes and preparing community members to effectively advocate for themselves and their loved ones.